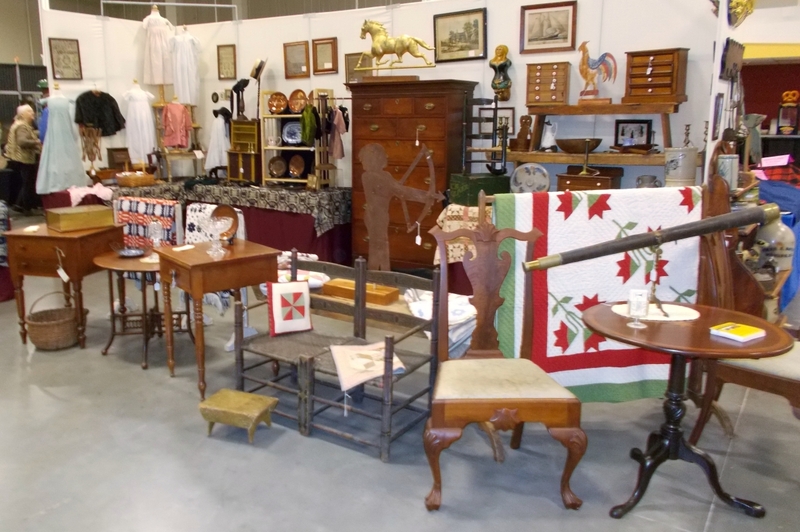 CHANTILLY, VA. – Joan Sides and her daughter Marthia Sides again filled the two connected halls of DC Expo at this Washington, DC, suburb with more than 700 booths of antiques, fine art, folk art, vintage home décor and choice collectibles on March 2-3. 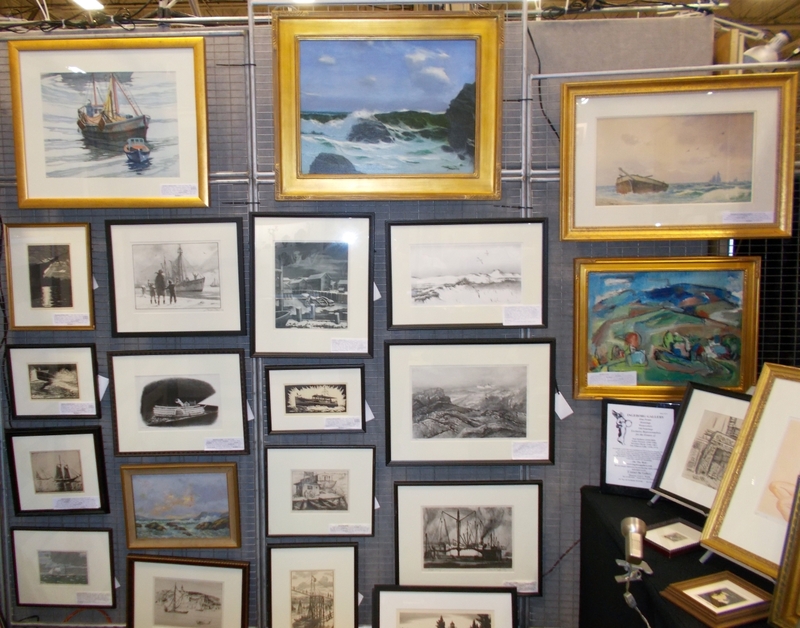 Saturday’s weather was just right for the giant indoor show – rain and not too pleasant – perfect to find something to do. 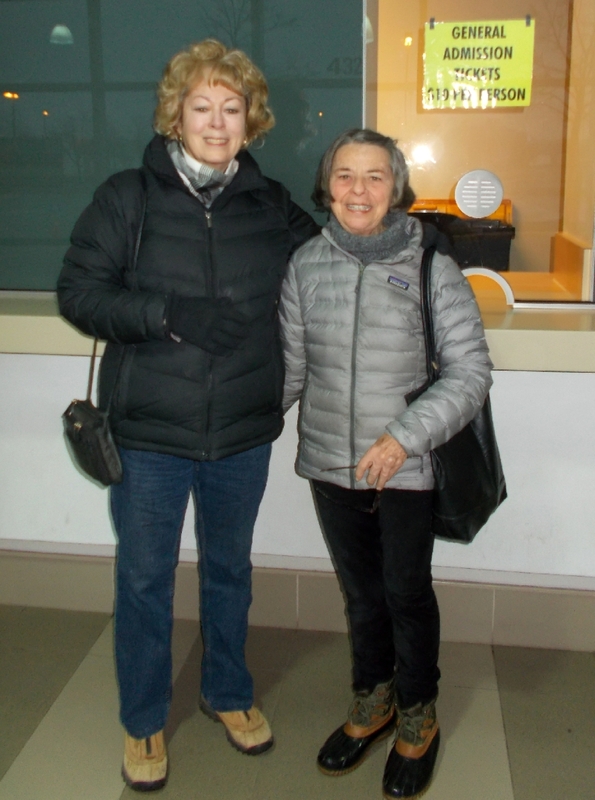 The sheltered halls saw shoppers flocking to the show in droves, filling them early and keeping it that way all day as they perused the exhibits and made selections. Ranata Ramsburg Antiques, Baltimore, Md., was fortunate enough to fill in at a prominent front booth with a selection of jewelry and Nineteenth Century home décor. Among early sales was a matched pair of antique applique quilts, 100 percent hand stitched. 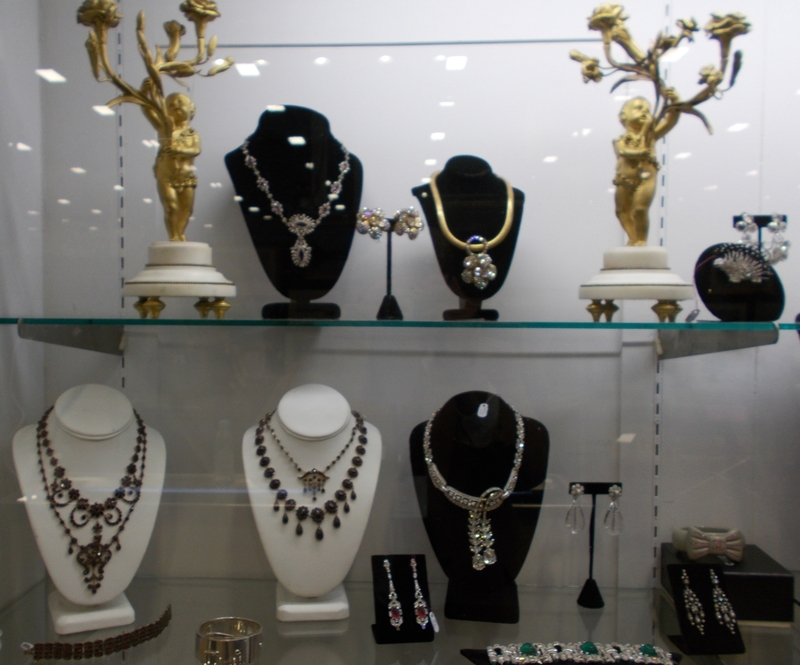 Over the two days, the dealer’s sales in jewelry were also good, as reported. Diane Kidwell from nearby Haymarket, Va., trades in Eighteenth Century Georgian-style furniture. This weekend, she was showing a collection of mahogany pieces with inlays – in particular, several small tables and stands with highly decorative floral work and also a circa 1800 butler’s secretary, which attracted a great deal of attention. Coming in from Atlanta as a fairly new participant to the show, Melissa Henley was selling silver and porcelain. Her collection in silver stretches over the last 200 years and features hollowware and complete services of sterling silver flatware for the dining room. The porcelain this weekend included rose medallion and rose mandarin from China. 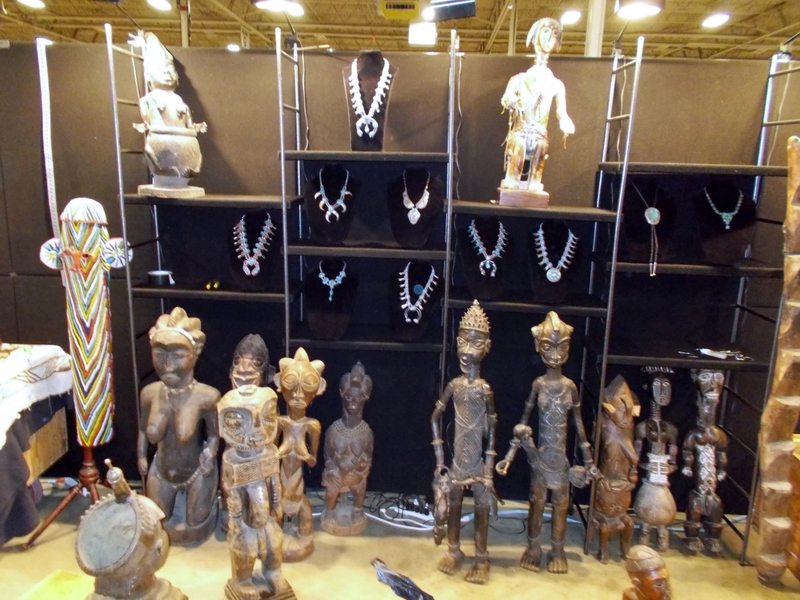 Otis Williams imports his antique art collection from Africa. 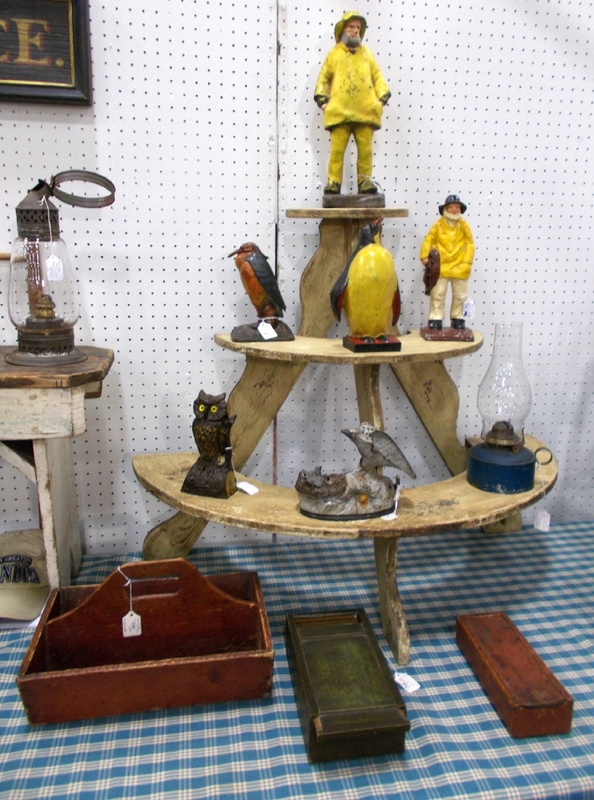 This Lambertville, N.J., exhibitor said his trade in the primitive sculptures and plaques has been very popular, especially with the latest decorating trends. Selling smaller etchings, antique prints and paintings is a specialty for Gert Wirth of Ingeborg Gallery, Northfield, Mass. 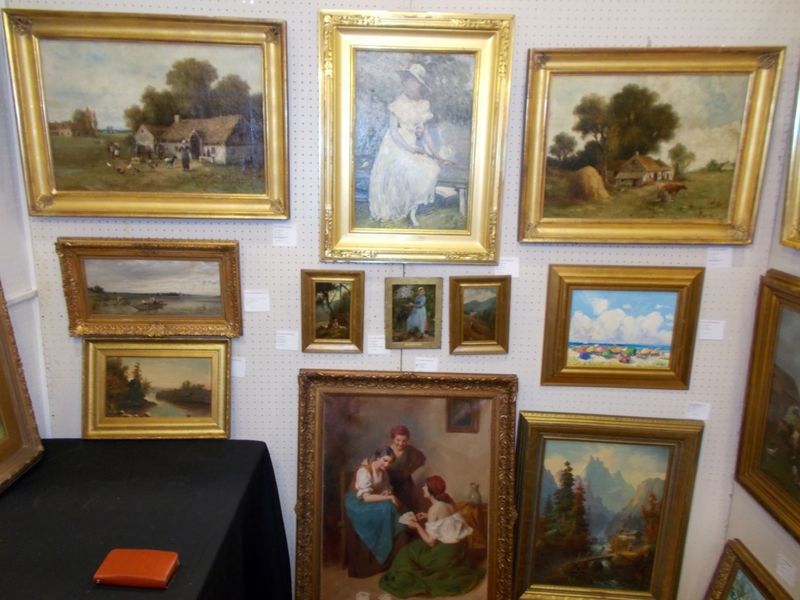 This dealer of fine art has his collection all framed and ready to hang, and he said his sales were good. A big sign said, “This is all fake glass, metal and plastic,” describing a collection of jewelry that looked just wonderful to the naked eye. 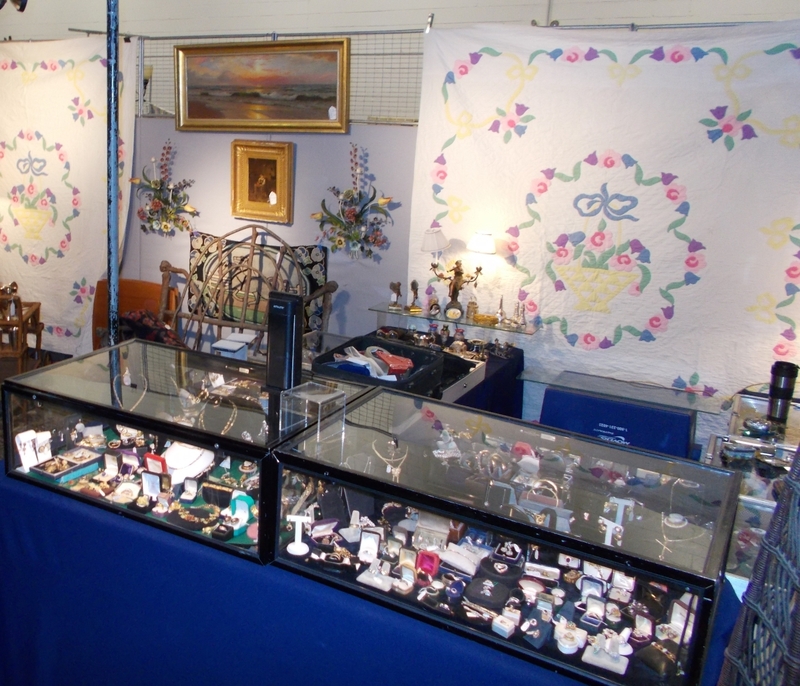 The exhibitor, Roy Reber Antiques from Hellertown, Penn., was showing several showcases filled with the jewelry – not precious, but still beautiful and selling very well. Another unusual exhibitor at the show was Mike Hammes Classic American from Iowa City, Iowa. 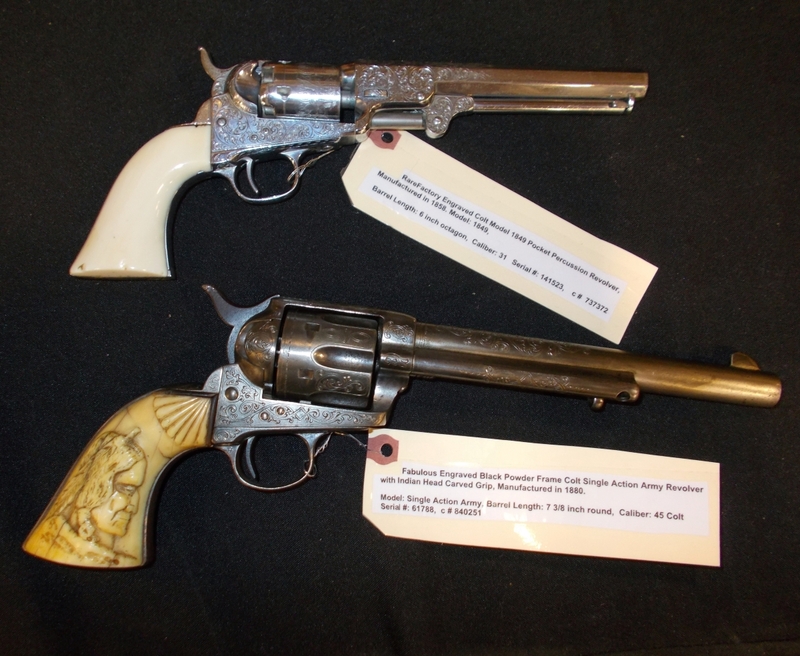 He was offering an assortment of late Nineteenth Century American firearms, handguns that he said were rare pieces. For example, one was a Colt Model 1849 percussion pocket revolver; also, there was a Colt single-action .45 caliber from 1880. While neither sold during the show, Hammes said be believed there was enough interest in these high-value pieces that he might hear from some of the interested parties. Pat’s Pots trades in earthenware and Asian woodblock prints. 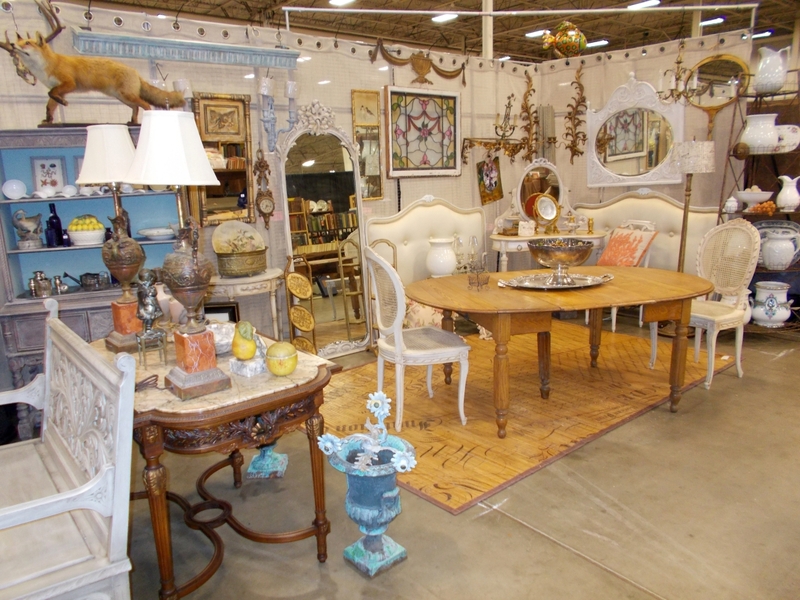 The dealers are frequent exhibitors at the show, trading here and from their home in Westport, Mass. 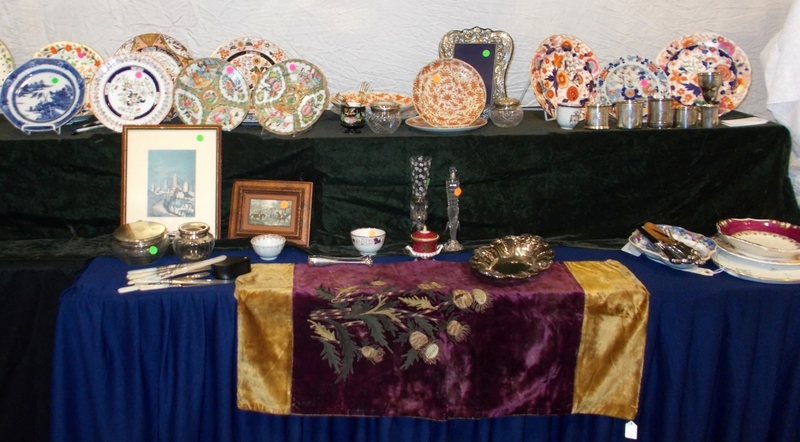 More antique earthenware was available from Flowerfield Art and Antiques. 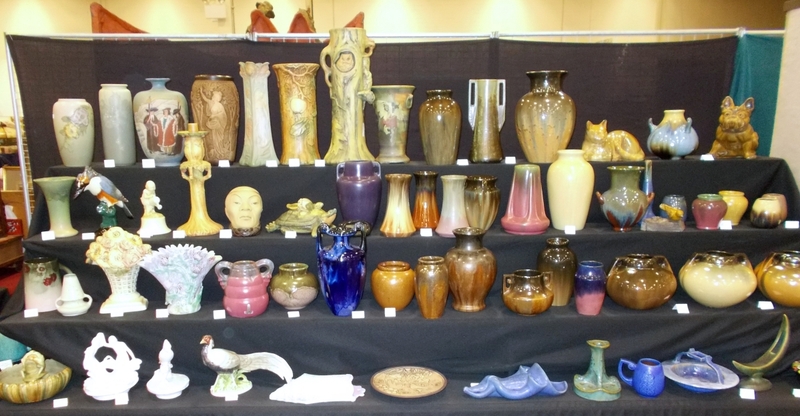 From Richlandtown, Penn., the exhibitor was selling Moorcroft and other turn-of-the-century pieces and even some majolica. Don Heller of Heller Washam, Portland, Maine, has become a regular at this market, offering traditional American and English furniture from the Colonial and Georgian periods. This month, his collection featured a large, blue, two-panel cupboard dating to about 1750; several large tables, including one with a built-in lazy susan from about 200 years ago; and a large cow weathervane in copper. 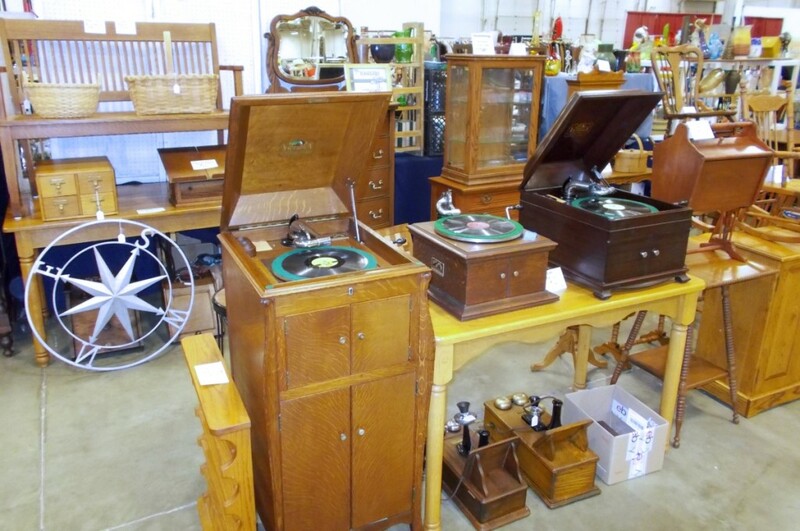 Garmantiques, New Holland, Penn., was new to the show in a large exhibit area – and the dealer really needed it. 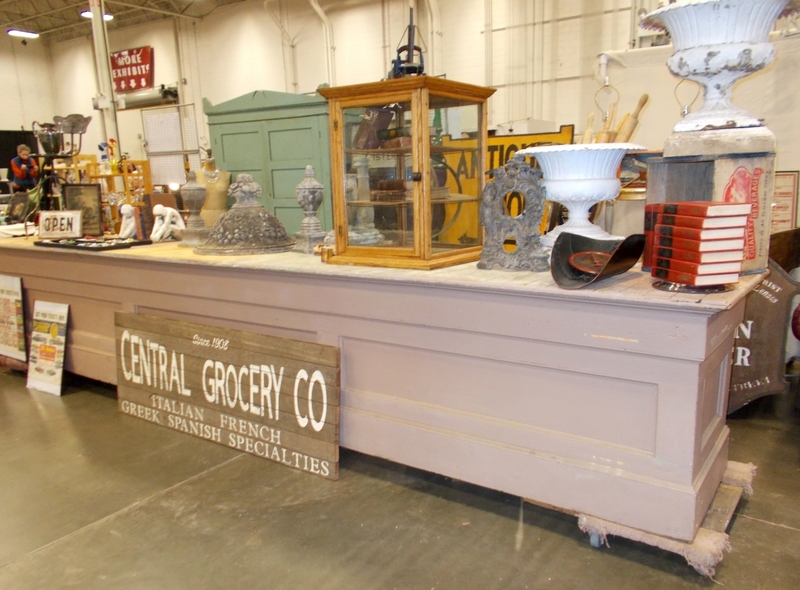 The exhibitor brought the whole store – Central Grocery Company, according to the sign – counters, cabinets, showcases and more, just about everything but the groceries. Inventory included more; there were urns, art and folk art, too. 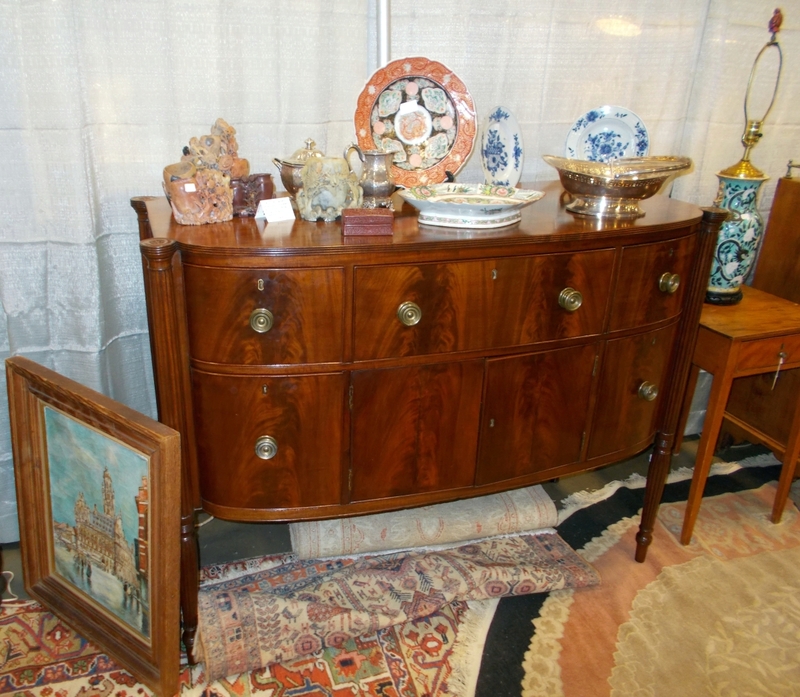 Another new exhibitor at the show was Walnut Cabinet Antiques, St Leonard, Md. 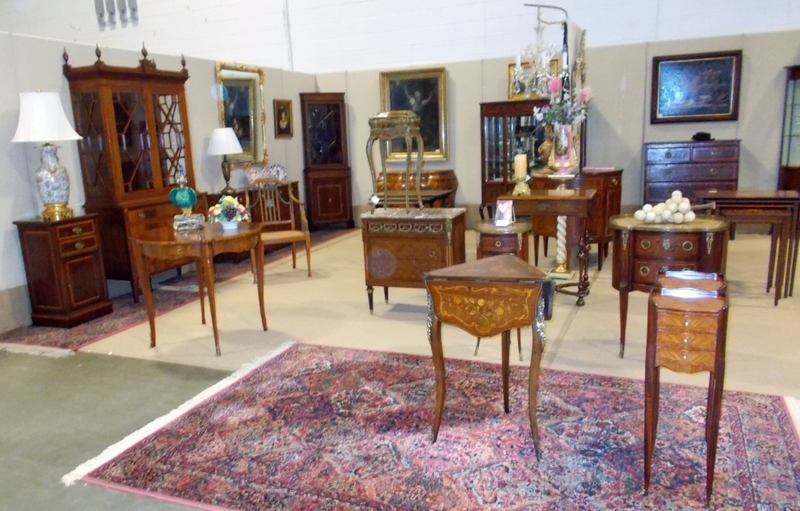 This collection was popular, as the dealer sold most of the furniture, including a pair of American Chippendale chairs; a tall chest in cherry, probably Baltimore, circa 1775; a mahogany tilt top tea table, Philadelphia, circa 1750; and several stands, all American. Offering in another direction was Streamline Classics, Philadelphia. 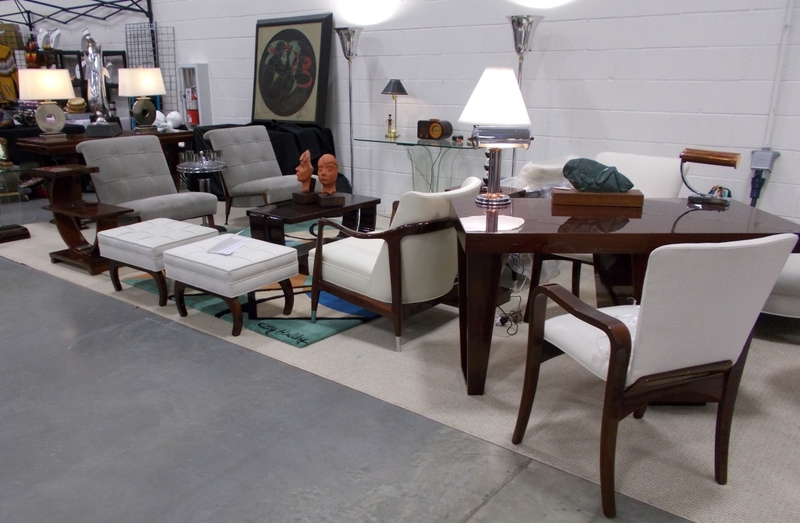 The collection comprised Midcentury Modern and also did well, selling from a room setting, which included lacquered bentwood pieces with white upholstered cushions, chairs and sofa and matching tables and stands. The weekend was unusual in that Saturday was very busy, with great numbers of shoppers. The weather forecasters were predicting doom and gloom for Sunday. In reality, it was only rain in the area, but the expectations had the effect of reducing the attendance on the second day. 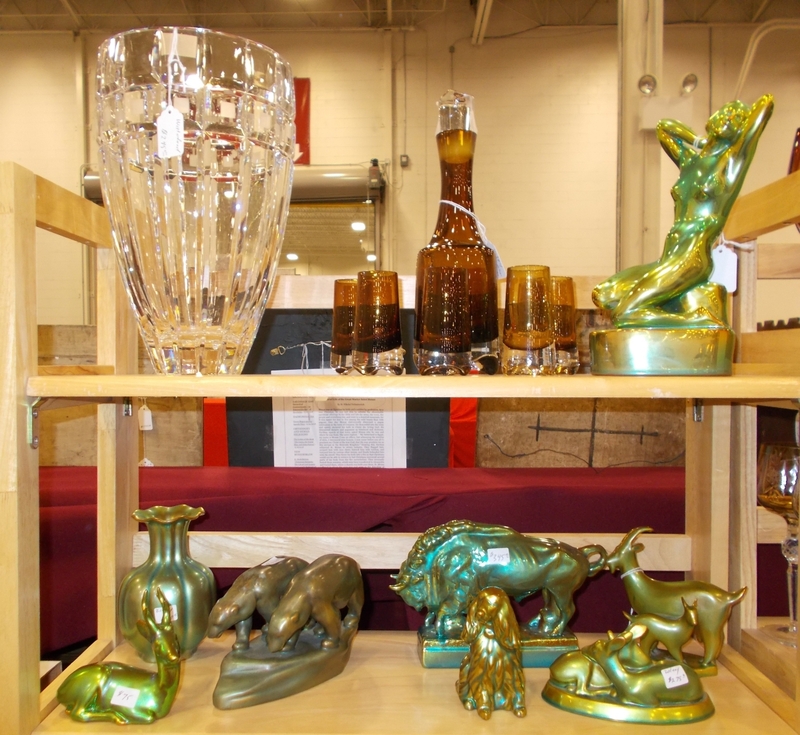 Even so, Joan Sides said, dealers reported being pleased with sales for their efforts, with good results Saturday and some additional activity Sunday. 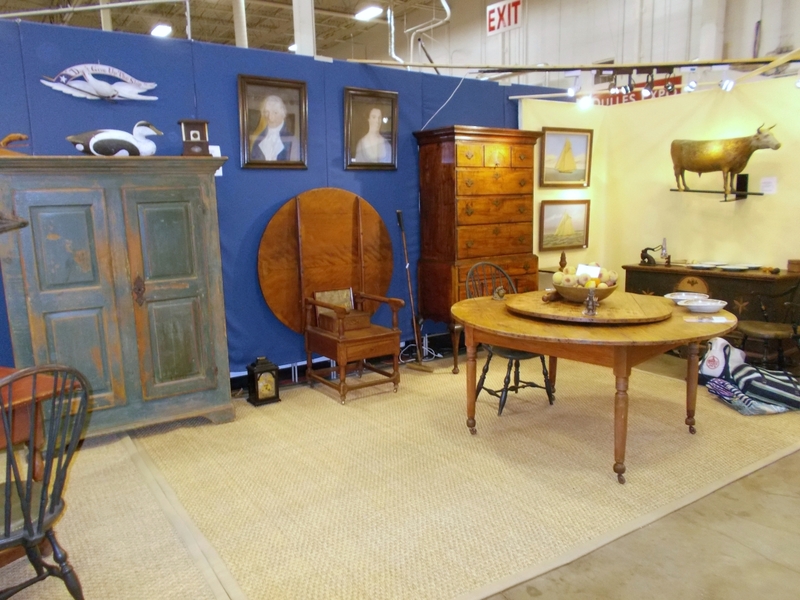 DC Big Flea & Antiques Market happens six times each year at DC Expo, with the next scheduled for May 4-5 and again July 20-21. D’Amore’s newest show in Hampton, Va., is March 30-31 at the Hampton Convention Center. For information, www.thebigfleamarket.com or 757-430-4735. Lois and her friend are frequently first on the line, but they are too publicity-shy to give their full names.